Basilique Notre Dame de la Garde - Marseille. 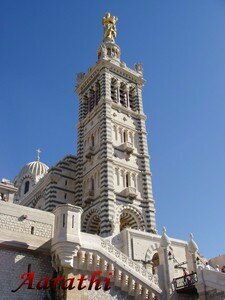 This Romano-Byzantine-style church is situated on the top of Garde hill - highest point in Marseille. (154 m) From the top, one can get a spectacular views around Marseille.The gliterring bronze statue of the Virgin & Child is seen far from the sea & is a landmark for sailors.Marseillais believes that they are protected by their "Bonne Mère" - Lady of the Guard . For Chandeleur, Marseillais buy Navettes blessed by their "Bonne Mère". Le palais longchamp - marseille. Commentaires sur Basilique Notre Dame de la Garde - Marseille.